The Wii U version of the game will include The Missing Link DLC and boast a number of console-specific enhancements. 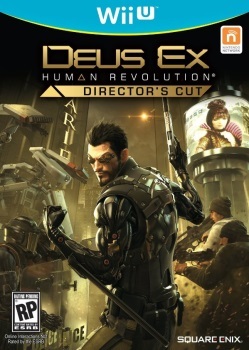 Eidos Montreal announced today that its hit action game Deus Ex: Human Revolution will be coming to the Wii U in an expanded and improved "Director's Cut." The updated edition of the game will include a number of enhancements designed to take advantage of the Wii U gamepad, including touch-screen hacking, interactive map editing, augmented sniping, grenade throwback and "many other neural hub enhancements." I'm not sure what most of that means but it sounds like you'll be doing an awful lot of poking at that Wii U mini-screen thing. Human Revolution on the Wii U will also include content that wasn't included with the standard release of the game, including the Tracer Tong rescue mission, which was previously available as a preorder bonus, and the post-release DLC The Missing Link that followed Adam Jensen's not-entirely-pleasant romp through a Belltower naval base. The Wii U edition will also feature improved AI, enhanced visuals, "overhauled" boss fights and other refinements to balance and combat. No official release date has been set but an Amazon entry, which has since been removed but not before it was captured for posterity by Joystiq, stated that the Human Revolution Director's Cut will launch on May 7.